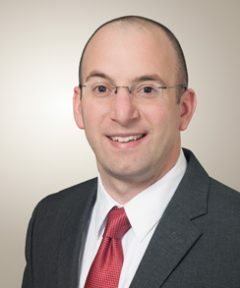 Dr. David Herrmann, graduated from Rush University School of Medicine and completed his obstetrics and gynecology residency at the University of Wisconsin Hospital and Clinics. Dr. Herrmann has long felt that obstetrics and gynecology is the perfect specialty, because of the opportunity to care for patients during some of the most important moments in their lives. He also enjoys the variety of the practice, with a typical day including everything from caring for a patient in labor, to performing a gynecological procedure, to seeing a patient for an annual exam. He likes the challenge in the specialty of balancing the latest research with current standards. As a member of a large family, he particularly loves that the obstetric side of his practice includes providing expert care for his patients as they begin or add to their families. He also has extensive training in minimally invasive surgeries, including vaginal, laparoscopic, and robotic hysterectomies. He connects with patients using a calm demeanor and a focus on thoroughness, making sure to devote the time patients need so they can make decisions to support their best health. Dr. Herrmann and his wife, Miriam, moved to Eugene from Madison, Wisconsin. They are excited to be starting their own family in such a supportive community. They are looking forward to exploring all the Willamette Valley has to offer, including hiking and trips to the coast. Dr. Herrmann is particularly excited about opportunities for nature photography and vegetable gardening.